An Amazing Farm House Table for dining and creating memories! Our rustic plank farm table is made from thick planks of tobacco barns boards, giving each table a unique charm. This Amish made plank table will surely become the centerpiece of your dining room. It is a one of a kind country farm table! Our old wood plank farm table is made of handsome reclaimed wood to present an aged, Old World antique look in a new piece of furniture. 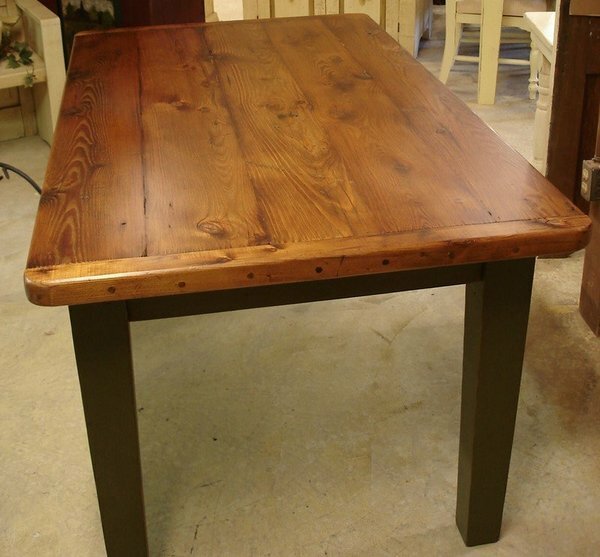 At DutchCrafters, we are proud to offer environmentally friendly reclaimed old wood tables. Reclaimed, unique old antique planks come back to life in this one of a kind farmhouse table. This wood farm table is handcrafted by Amish woodworkers from recycled antique planks from old tobacco barns. These salvaged thick planks of old tobacco barn boards are naturally weathered and distressed. There will be grooves and saw marks and sometimes even nail holes which can be filled upon request. The table wood is then finished in a hand process that has over 10 steps that bring out the distinctive character and look of the natural old wood. 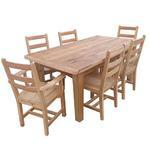 This Amish plank farm table is our all-time best selling dining room table! Our old wood plank farm table is highly popular for homes ranging from traditional to modern styles. Available with a 2" table top! The Amish Plank Farm Table is handcrafted from old pine wood planks, to create a rustic, unique look. The wood planks come in varying sizes. The planks running longways are glued together. The breadboard ends are attached to the planks using an old world technique of mortise and tenon construction. This is an extremely well-crafted plank table and is very durable! The plank farm table top is finished with a stain to match the old wood finish and 5-10 coats of a matte poly-finish are applied for years of regular dining use. Old wood has a distinctive charm in its look. There will imperfections in the old wood which just adds to the uniqueness of it. Each marking on the wood tells a story of where the wood has been. These screw holes, gouges and indentations add to the rustic charms of this table. The old wood may have existing screws and screw holes, paint in grain and/or pine knots, and/or hairline cracks in the planks. These add to the rustic, farm look of the table. These screw holes can be filled upon request. Since this plank table is made using old, antique planks it needs 5-10 coats of a matte poly varnish to achieve a smooth, even finish. The first 3 coats just soak right into the wood. Then the additional ones are needed to get a nice smooth even finish. Most of the wood comes from tobacco barns. Different types of oil and even smoke can be absorbed into the wood from curing the tobacco over the years. What the wood has absorbed over its life influences how much poly needs to be applied. The finish will not have a thick appearance even with so many coats, which adds to the unique charm of each table! The table legs and skirt can be finished in numerous paint choices. It is available with a Shaker or turned leg and several sizes. Paint samples are available for you to see before making your decision. Extension boards are also available that attach to each table end. Your one-of-a-kind plank table will be the conversation of every dinner party, and you'll enjoy it for decades to come! An additional benefit that comes with our plank dining tables is that because they are made from refurbished wood, rather than virgin forests, our plank tables are an ecological choice! An Amazing Farm House Table for dining and creating memories! Our rustic plank farm table is made from thick planks of tobacco barns boards, giving each table a unique charm. This Amish table will surely become the centerpiece of the room! A one of a kind country farm table! Our old wood Amish plank farm table is made of handsome reclaimed wood to present an aged, Old World antique look in a new piece of furniture. At DutchCrafters, we are proud to offer Amish furniture in environmentally friendly reclaimed old wood. Height from Floor to Skirt: 24 ½"
Table Top: 3/4" to 1 ¼"
Overall Drawer Depth: 3 ½"
Inside Drawer Depth: 2 ½"
I adore my table! Thank you!